Wine tasting exercice : We are at the dawn of complex molecules retrieval in extrasolar planet atmospheres, so it looks to us as being equivalent to the perfect moment in which to proceed with further inverse problem solving - blind wine tasting! As you remember, on the two tables you had 8 wines to taste, o the left side of the table was with the Rhone wines, and on the right side was with the Bordeaux. The idea was to try to take you to a short journey, in two very distinct regions of France. 85 % Semillon, 15% Sauvignon blanc. A very well made St Croix du Mont, with golden color, rich and ample flavor. 70 % Merlot, 10 % Cabernet Sauvignon, 20 % Cabernet Franc. Tanic and well made wine. Beppe-Crosarial (Globe and Mail) : "The cote de Montpezat delivers pure cassis like fruits as well as nice, classic Bordeaux notes and mineral and pencil shavings and juicy acid". 56 % Cabernet Sauvignon, 28 % Merlot, 15 % Cabernet Franc. Second wine of chateau Haut Bailly, Pessac Léognan. Beautifull floral nose, some meaty elements alongside some attractivity perfumed red fuit,. Gentle, moderately concentrated, rather firm and intense tanins, light but smooth finish. 50 % Cabernet Sauvignon, 40 % Merlot, 10 % Cabernet Franc. Complex and elegant, very well balanced, one of the best St Estèphe wine in an excellent year. Debriefing : most of you recognized that the sweet white wine was the Saint Croix du Mont. 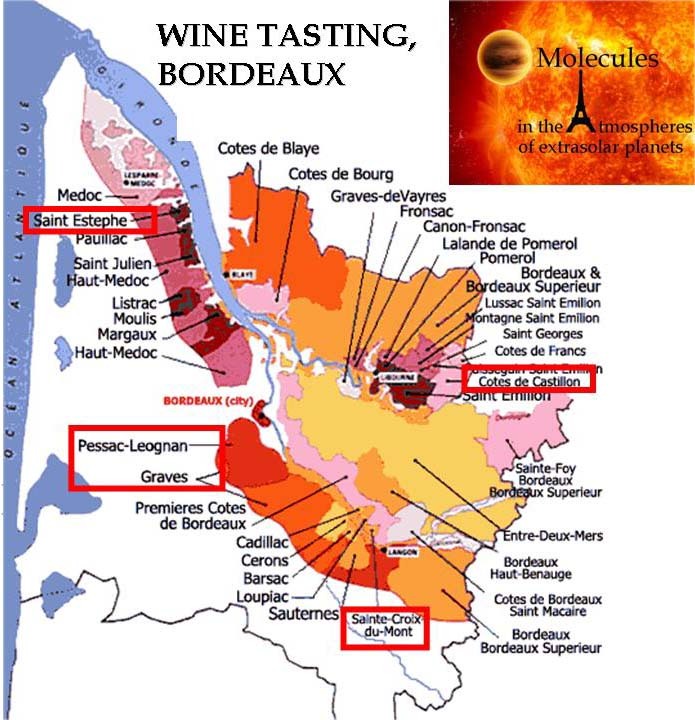 Figuring the way out among the three Bordeaux red was more tricky. The Saint estephe has been quite well identified, but there has been a bit of confusion between the Cote de Castillon (small name, but well made), and the Pessac Léognan. - Sweet wines from Bordeaux : you immediately think about Sauternes ! 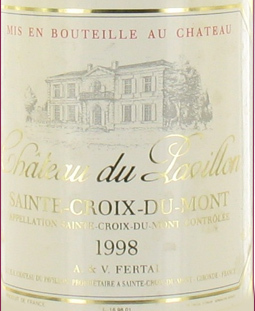 Here, we provide you with a Sainte Croix du Mont, meaning a less known area, a satellite of Sauternes. Something to keep in mind when choosing your wine. Don't forget the satellites ! Such wines can age beautifully, getting in complexity. This one was 10 years old, good to drink now. A well made wine, from a good year in a "satellite" will make you happier than a regular wine from a more famous area ! - Cote de Castillon : It is a typical Bordeaux wine, with Merlot, Cabernet Sauvignon andCabernet Franc. We are 30 km away from Bordeaux, towards St Emilion. It shows you that you do not need to have a prestigious name (I guess most of you have not heard of Cote de Castillon before), but when well made, it is very pleasant. - La Parde de Haut bailly is a "second wine", meaning you have a "grand cru classe" the Chateau Haut Bailly, and the very same people are doing a wine with the same passion, in the same area, but that is not entitled to have the name "Grand Cru Classe" (because the plot of land does not have this label). Therefore, it is sold cheaper, but it is of excellent quality. That's one thing to remember "on good years, do not hesitate to go for the second wines of big names". This is most of the time excellent value ! - Chateau de Haut Marbuzet is a famous Saint Estephe wine (médoc area). If you want to do shopping, you can find them at the shop "la grande épicerie, le bon Marché" in Paris, but likely also abroad (at least for the Marbuzet and the Parde de Haut Bailly). It is rude in France to speak about the prices of the bottle you put on the table, but I think here it is a good opportunity to show you that you can get nice wines, for very decent prices. The Saint Croix du Mont is priced 10 euros, the Cote de Castillon 8 euros, the Pessac Leognan 19 euros, and the Saint Estephe 23 euros. It is a 100 % Syrah, with typical flavors from the South East of france, reglis, blackberry, prune, olive, long finish, smooth and velvety. Grenache and Mourvendre grapes. Dark red, grenat color, very intense. Thym, romarin, figues, pears and spices. Very long finish, warm. 100 % Viognier, a grape that provides sensuality, but that could be also "capricious". Here, it is a superb result. Robert Parker wrote about this one : "Peach apricot, lychee nut characteristic in its stylish fruitforward personnality". Usually with Condrieu, one finds peach, abricot and also violet flavors. Mostly white Grenache, with also Bourboulenc, Clairette and Roussane. Powerful, rich taste, well balanced with spices and white fruits. 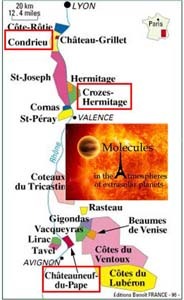 Debriefing : The easy one to identify was the Croze Hermitage (young full bodied, very bright color, almost a new world wine!). Since it was the youngest, it was pretty straightforward to pick it up in comparison with a more complex one. Therefore the red Chateau neuf du Pape was identified too without much difficulty. However, between the Condrieu and the white Chateau neuf du Pape, it was hard, because both were very well made, and I have to confess that the organiser himself was lost on this one ! 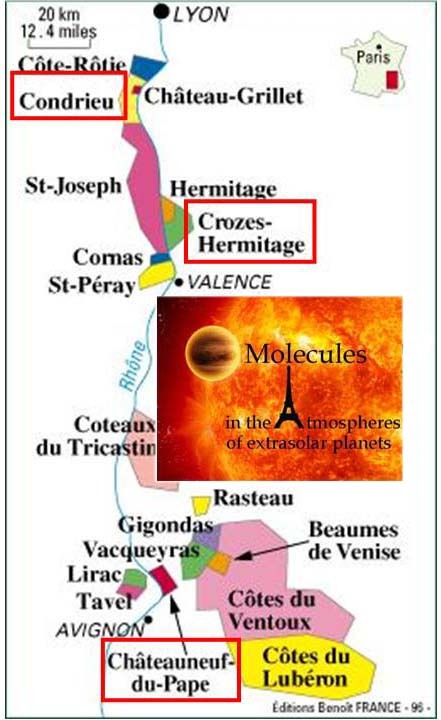 In terms of prices, the Croze Hermitage is priced 7 euros, the two Chateau neuf 25 euros, and the Condrieu 30 euros. All of them are available at "la grande épicerie, le bon Marché" in Paris. We hope that you enjoyed this small trip in these two regions of France ! We should have given more information for the wine tasting, we will next time. About half of you identified correctly the Chateau Marbuzet, the other mistaked it with the Pessac Leognan or the cote de Castillon. A large fraction of you identified correctly the St Croix du Mont too. On the Rhone valley, it was a bit more chaotic, especially between the whites. I got 14 answer sheets. It is pretty clear that a full batch of them got lost at some point. I will come back to you individually to tell you the outcome the coming days, but we can have a Podium.